As a kid back in the late 70’s (yes I am that old) things like football left me cold, why would I want to watch other people kicking a ball around a patch of grass? For me it was cars and motorbikes that captured my imagination. I had a massive poster of a black and gold JPS Lotus (driven by Ronnie Peterson) on my bedroom wall, and although it was thrown out decades ago I can still picture it now. However there is one thing I did keep from back then. It’s an advert pulled from the back of magazine for the Tamiya Sand Scorcher. 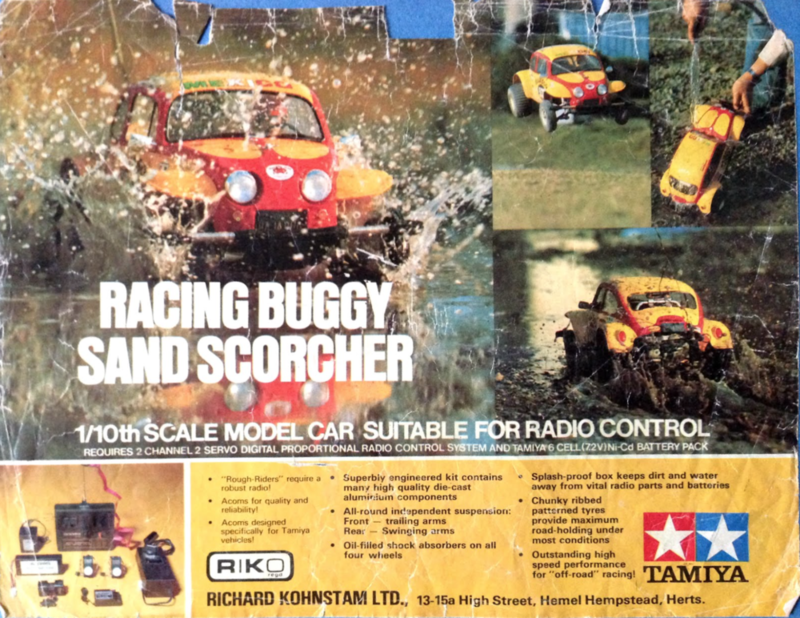 Tamiya were (and still are) a company that made scale model kits, but the Sand Scorcher was different from the usual Spitfires and Messerschmitt’s that people associate with model kits, it was a scale radio controlled off-road car. To my eyes it looked f***ing amazing, in a bizarre bug like way. It was also horribly expensive, well over £500 in todays money and then you’d have to spend another few hundred on special batteries and radio gear. Needless to say my parents said no. But I didn’t forget and over the years I learnt more about the Sand Scorcher and the Baja bugs on which it was based. Baja bugs (pronounced Ba-ha, not badger) were modified VW Beetles, designed to be an affordable way into off-road racing. VW bugs were cheap and durable and proved popular in the American desert races of the day, such as the Baja 1000 – a thousand mile point-to-point off-road race in Mexico, and the Mint 400 – named after the Las Vegas casino that organised the event (it was also the race featured in Hunter S. Thompson’s ‘Fear and Loathing in Las Vegas’). Both races still run, but are much more professional than the insane desert free-for-alls of the 1970’s.